In this post, I am going to speak about how design is such a crucial part of the music industry and how it is used effectively. Making and producing music is an intensely creative thing to do it needs inspiration and passion. Music can tell a story and hold a lot of meaning so it’s important that this creativeness isn’t lost when it comes to the way that it’s presented visually. One of the biggest and most obvious uses of design in the music industry is album artwork. It is the first thing you see when purchasing an album and although the artwork is accompanying an album, by itself it’s still a piece of art, it didn’t just appear it had to be thought out and designed. You many not consider album artwork as overly important, however, sometimes the artwork is more recognisable than the music itself. One example where my point is demonstrated perfectly is the American rock band ‘The Velvet Underground & Nico’ their album cover featuring Warhols’ iconic banana painting has been seen and is easily recognisable regardless of if you like or listen to the band’s music.This shows the power that a good album cover can have. Throughout the years’ many artists have released albums with artwork that have stood out against all others whether that’s for good or bad. I personally am a sucker for a good album cover, I have iconic covers all over my bedroom wall and I view them as I would art in an art gallery if not with more interest and depth. Think about it, you can interpret and appreciate the art while you listen to the music that inspired it and that for me is a really interesting and enjoyable experience. Like I said before some album artworks really stand out against the millions, here is a couple that I personally love. 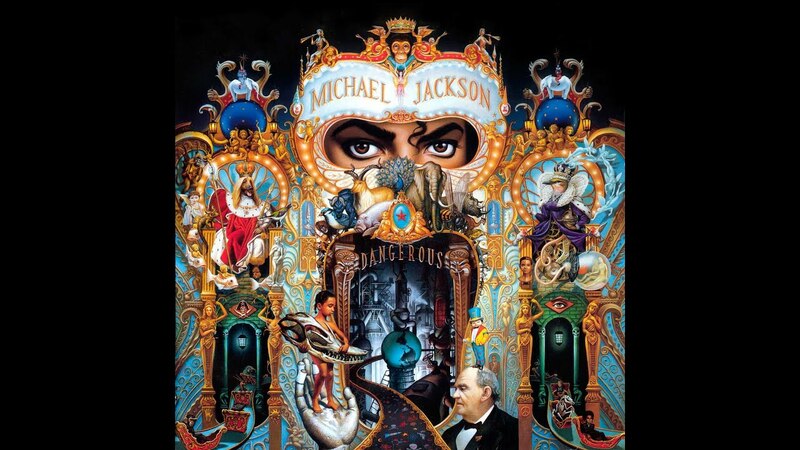 Dangerous was Michaels eighth studio album and it was released back in late November of 1991.The artwork was created by Mark Ryden, Ryden has worked with may high-profile individuals including Stephen King and The Red Hot chilli peppers. The cover took 6 months to produce and is one that stands out to me due to it looking very busy. It is said to represent Michaels life in one piece of art and the inspiration for the cover was taken from circus posters. There is obviously a lot I could talk about regarding this cover so let’s just talk through a few of the many features, The monkey at top of the image is said to have been ‘Bubbles’ the chimp that Michael rescued from a research facility back in 1985. The cluster of various animals just below Michael’s eyes are said to represent the beauty and glamour within the music industry. There is a lot of speculation about the various aspects of this artwork which I think makes it even more fascinating, the idea that it’s up for speculation and personal interpretation really intrigues me. This is definitely one that I recommend that you should look at in more depth as there is so much information out there. This simplistic yet the distinctive cover is the visual face of legendary rock band Pink Floyds eighth studio album ‘The Dark side of the moon’. It was created by English graphic designer and music video director Storm Thorgerson, Thorgerson has worked with many of the greats including Led Zeppelin, Genesis, Black Sabbath and of course Pink Floyd. The inspiration for the artwork is said to have been taken from the bands extraordinary stage lighting and psychedelic identity at the time. 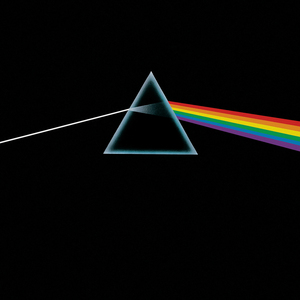 Founding member and Keyboardist of the band Richard Wright requested a simple graphic design for the cover and Thorgerson sure delivered.The cover presents a prism that depicts refracting a beam of white light and separating it into the seven colours that white light is made up of. The cover also doesn’t feature any text, this alongside the single image makes for a minimalistic design that is sure to stand out on and break up a busy records store display. I chose to speak about the ‘Dangerous’ and ‘The Dark side of the moon’ covers as they are very different when it comes to their level of complexity and detail. Which just shows the power and success that each approach can have in making an album cover recognisable by all. I have spoken about how design is used when it comes to album covers I am now going to speak to you about another major element of the music industry and that is, of course, live shows. Many artists strive to please the crowds with breathtaking visuals to accompany their music. There have been some very expensive and unique productions over the years so I am going to talk you through a couple of the wackiest and well-designed staging setups. Kanye West is known for his odd behaviour so of course Yeezus himself could not embark on any typical tour. He came up with the idea of himself being above the audience on a floating platform, the thinking behind this is said to have been in the aim of demolishing the seating hierarchy within concert arenas. Having the stage moving meant that everyone regardless of their seating positions got to have a great view of the man himself. The stage was 16-by-20-foot which to put into perspective is the same size as a boxing ring. It was suspended by framework known as trusses which allow the stage to hover 15 foot above the crowd below. The movement of the stage was controlled by backstage crew who has the power to move the stage around the large arenas in all directions. It was said to have taken 8 months to design and produce. This design was innovative and was a start to breaking down something that has been an issue for music fans throughout the ages. Lady Gaga is another star who isn’t afraid to stand out, this was demonstrated perfectly by her Born this way ball. Gaga toured worldwide with her 1 million dollars ‘Kingdom of Fame’. It was designed based on sketches by the pop star herself. It was a gigantic 5 stories tall set designed to look like a gothic castle which matched the theme of the album perfectly. It weighed weighed a hefty 30 tonnes and took 15 tractors to transport from venue to venue The way it was designed was revolutionary as it only took 6 hours to build even considering the weight and size. This design gave fans a visual insight into Gaga’s mind and how she envisioned the visual aspects of the album. It looked fantastic and allowed her to put on a really wonderful show. Both Kanye’s floating stage and Gaga’s kingdom of fame were perfectly designed to represent the artist and their music. As you can see the music industry is very heavily reliant on design, it oozes creativity through all aspects. Maybe this post will open up your mind and help you to realise how important design within the music industry. I cannot wait to see what other artists do in the future. Next Next post: The Vinyl Tag.